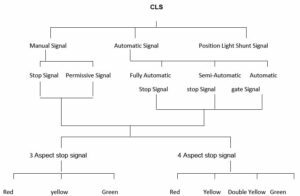 Types of Signals :- Signal is a medium to convey a particular pre-determined meaning in non-verbal form. 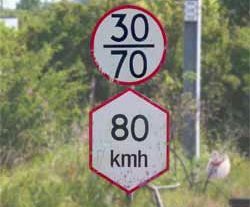 Multiple Aspect Color Light Signal (MACLS): Multiple means more than 2 indications .They may have 3 or 4 different aspects or indications to be given to the driver. 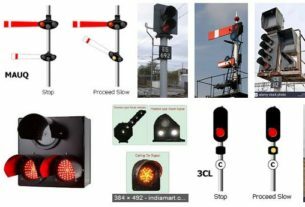 These signals have longer range of visibility and Improved reliability. Each aspect of the signal is represented by a circle. A horizontal line inside the circle indicates Red aspect, an inclined line the yellow aspect and vertical line the Green aspect. The normal aspect of the signal is shown by double line. Shall be located at an adequate distance in rear of the stop signal, the aspect of which it pre- warns. 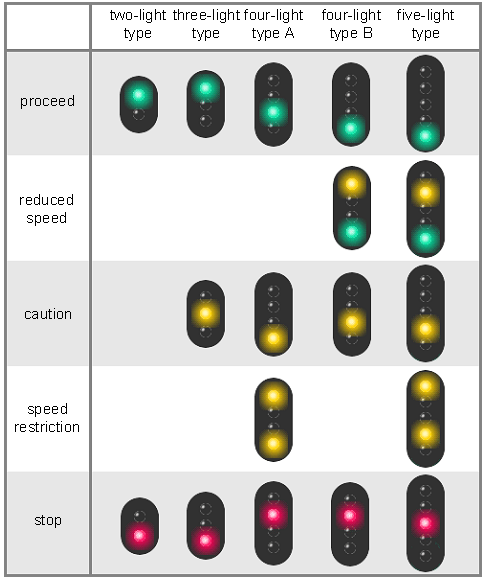 The normal aspect of permissive signal is „Single Yellow„ where 2 distant signals are provided to pre- warn the stop signal, the outer most signal, to be located at an adequate distance from the first stop signal, shall be called the distant signal and the other called the inner distant signal, with the distant capable of displaying „ attention „ or „ proceed‟ aspect only . To distinguish between stop signal and permissive signal „ P „marker board (letter in black on white board) is fixed to the permissive signal. 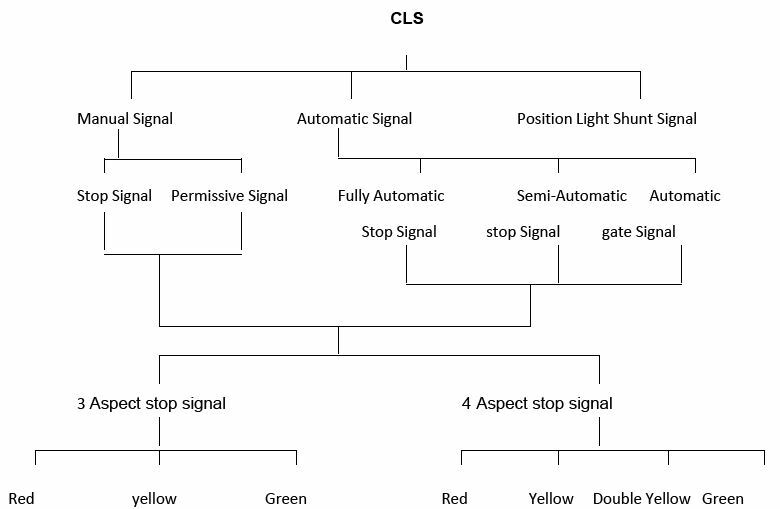 The normal aspect of an automatic signal is green and is indicated by the double vertical line, unlike the manual signal where the normal aspect is red and indicated by double horizontal lines. An automatic signal has an „A‟ marker plate fixed to the signal post to distinguish it as an automatic signal. Letter „A‟ in black on white circular disc. An illuminated „A‟ marker distinguishes a semi – automatic signal from a fully automatic signal. Letter „A‟ against black back ground is illuminated when working as an automatic stop signal and letter „A‟ extinguished when working as a manual stop signal.